Michaela Atanassova in Gaming Uncategorized on 18 February, 2017. 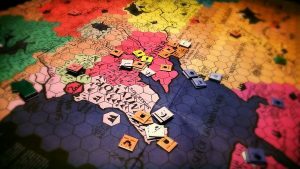 For avid strategy gamers the most important part of a game is how complex and challenging is the development of an empire. That is why 4x games provide the needed challenges than most as they rely heavily on diplomacy, research, technology, resource management and have a larger scale of impact. They do not need to be turn based and have the features most strategy ones have like explore, expand, exploit, exterminate. However, real-time strategy games like Starcraft or Warcraft offer the opportunity to learn to make decisions quickly and use resources to your advantage. For Warcraft it is tricky as heroes have individual development paths and achieving it as fast as possible creates pressure. On the other hand, there are games that are hybrids like Rise and Fall: Civilizations at War, Commandos 2, Spore, Total War: Warhammer, Heroes of Annihilated Empires, Spellforce which defied expectations and whether successful or not brought new ways to plays strategy games.In this article the most challenging strategy games will be examined and look into more closely what made them successful. For the past decade there is a trend for game developers to combine elements of RTS and TBS games in franchises like Rome Total War, Civilisation series, Heroes of Might and Magic, Age of Wonders. Finding a game in its pure genre has become something rare. However, the advantage of such combination is the player has the option to choose his own rhythm and whether to get involved in decisive real-time battles. Even though, turn-based games may be boring to some because if their length and the commitment they require, they give more time to plan a strategy but also to learn from trial and error. RTS have more dynamic atmosphere and fast learning is key in order to win. For example, in Warcaft III knowing the most efficient ability path for every hero and the corresponding objects that enhance the magic performance is crucial. Moreover, leveling up fast and using correct tactics to ambush or deal with gang may turn the tables of a game. Eventually the most important factors for a complex environment is timing, teamwork, speed. Starcraft, on the other hand, is more based on using resources and tech advances in order to develop quickly your faction and become on top by winning battles and exterminating the enemy. For Gamers who have grown tired of over-the-top action buzz can turn to 4X strategy games which are more focused on the efficient allocation of resources, on interaction with potential allies or enemies, on challenging unpredictable gameplay. Detailed control of the empire is transferred across battles as well where superior technology, which give extra combat skills, is a factor for victorious armies. Sid Meyer’s Civilization series marked the beginning of the genre and successfully maintained the system engaging and profound. Total War franchise, Galactic Civilizations, Endless Legend continued to pave the way for new strategy games based on RPG, RTS and 4X elements. The options to win a campaign are numerous and depend on the player’s style of approaching enemies – either conquering them militarily by force or diplomatically by making them vassals, satraps or part of a confederation. Galactic Civilizations unlike Civilization series adds another important aspect of an empire’s economy which is the production of products and costs connected with them are paid from the economic income. If a planet cannot support the industrial good it runs on deficit and bankrupts if not corrected. Also, diplomacy is successful given the sufficiently high negotiation skill which is neglected in most strategy games and typical for RPG. Star Ruler offers exciting opportunities to do things that are not possible in order games and more importantly to the limits of the game depend on your PC strength. What I loved about it was the chance to build artificial planets and ring worlds, blow up stars and to create a network of worlds that support your core ones, the inconvenience of losing strategic planets that can support dozens of worlds. Exception in the genre are games that satisfy the conditions for a strategy game but also include multiple features of other genres which makes them a hybrid. For example, Spore had an agenda to lead the player through a personalized development of a race and subsequently conquering the galaxy. It had strong ideas for the development of planets and the relationships with other factions, however the gameplay became repetitive with progression and not so challenging. Commandos 2, on the other hand, is one of the hardest strategy games I have played because like Dark souls if you lose you go back from the beginning and going back to a save checkpoint turns out to be unwise. The player has to go through levels with his squad of soldiers who develop different abilities in their own specialty but real-time tactical positioning is key in order to keep them alive. Making mistakes is costly and making decisions is sometimes mind bending at higher levels where you are undermanned and required to survive. Total War Warhammer explores in depth the use of magic in battles and the Generals of previous games become Lords or so called heroes who fight in battle without bodyguards and have skill tree, can receive unlockable items and abilities when completing quests. It uses Atilla’s campaign map but with more severe climate conditions. Every faction has different lores of magic like the Dwarfs cannot access and other are highly dependent on them. Magic makes a difference as strategic units can turn the tides of battle as they become more powerful. To sum up, modern game developers strive to challenge gamers with new and more complex environments while providing action packed gameplay. Of course, for those who love only to build there are classics like Zeus and Caeser 3 or extreme real-time sci-fi like Sins of a Solar Empire, Homeworld. Whether it is turn based or real-time strategy depends on how much pressure you want to feel or how you feel about the pacing of the challenges – either the arduous continuous or the instant dynamics that need quick reflexes. Many of the games above-mentioned succeeded in delivering an exciting experience where staying sleepless night does not seem like much of a price to pay for the pleasure of conquering a long-lasting foe or just beating the game and becoming victorious after countless struggles. What may be reported as weaknesses of strategy games for most FPS gamers is the lack of fast-pacing and immersive content. Well, with new engines everything can be accomplished in terms of graphics and seeing the release of Warhammer I can say there are more entertaining advances to be expected in graphics and gameplay.